Neil McDaniel was born in Margaree Forks, Cape Breton, in June of 1975. He was introduced to music by his oldest sister, Leslie, who sang and played an antique pump organ in the old homestead. Leslie sang as much as she talked, in English and in Gaelic, and it was completely inspiring. The organ she played on had seen better days 50 odd years prior but nonetheless still had a lot of magic to it. Aside from divine tones it started the foundation for McDaniel's understanding of music and theory. His self-taught methods of understanding harmony, ear training, improvisation and composition all developed from this. Several styles of music including Irish, Country, and Folk were influential, but Neil was more just caught up in music's pure soul, regardless of genre. A strong connection was formed early, about the age of eight, and he was self-driven, and fuelled by imagination. The Cape Breton scenery does a good job inspiring one's mind and artistic flavour and throughout high school, Neil continued to progress with music on his own terms and developed an interest in additional instruments such as the guitar, digital keyboard and harmonica. Neil travelled, worked and toured Canada, coast to coast, after university. As he worked with numerous bands, he learned to appreciate a variety of approaches to music, band dynamics and performing in all kinds of settings. For the past several years Neil McDaniel has settled in Ottawa, focusing more on composition and learning new instruments including mandolin, banjo, and whistles. Along with solo performances, Neil still works with a number of groups: The Sarah Burnell Band, Celtae, Kilbride, and East Coast Ceilidh to name a few. In 2008, he released his first solo CD, "10 Years Too Late" which highlights songs and instrumentals that have been on the back burner for some time. 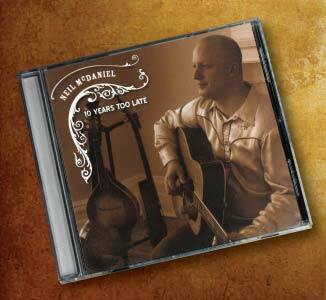 These well received recordings have earned him a nomination (Best Roots Album) for the 2009 East Coast Music Awards. After a few a trips to Ireland and time spent back home in Cape Breton, McDaniel has continued to write, but also work on traditional Celtic music much more. and in 2011 a new recording was in the fixings and Neil joined up with a great fiddler from the Ottawa Valley, Kyle Felhaver. Together, they arranged some awesome traditional Irish and Scottish songs and instrumentals and created their own studio (Purgatory Studios) as they engineered the project. March 16, 2012, they released this new album entitled Salt, Rock, and Roots.